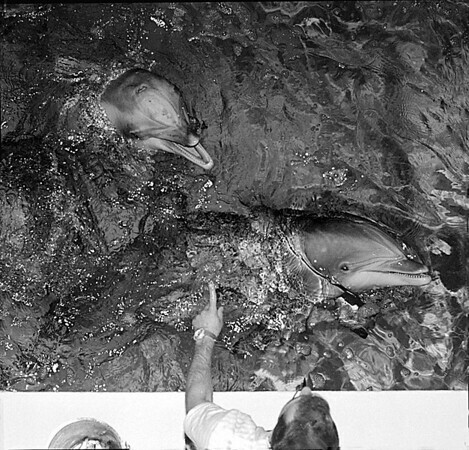 1/13/97--DOLPHINS--CAPPY PHOTO--KURT BUTKIEWICZ, AQUARIST OF MARINE MAMMALS, OF MISTIC CONN. PUTS THE NEW DOLPHINS THROUGH THEIR PACES. BUTKIEWICZ, WHO CAME FROM CONN. WITH THE DOLPHINS, IS IN RESIDENCY UNTIL THE END OF THE MAMMALS STAY AT THE NF AUARQIUM.